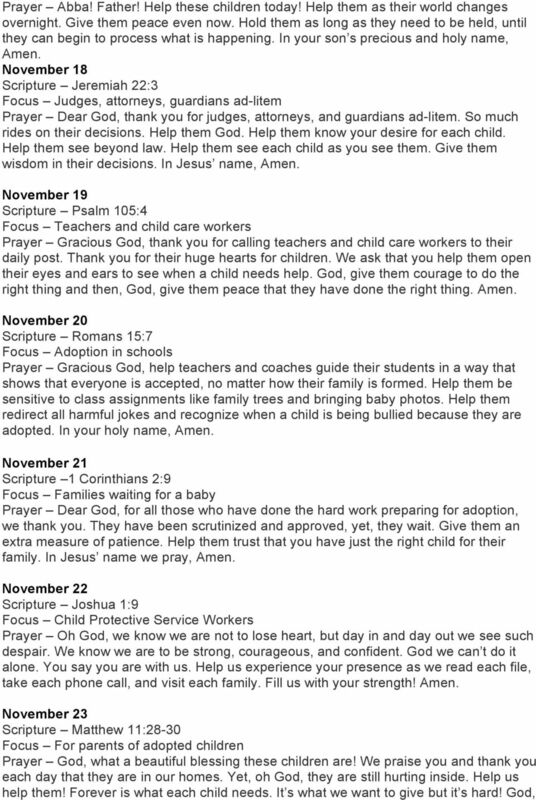 Download "Adoption Awareness Month Daily Prayers"
1 Adoption Awareness Month Daily Prayers Begin each day with prayer for the children, their families and those who seek the best for each child. Remember, Seek the Lord and His strength; seek His face continuously. 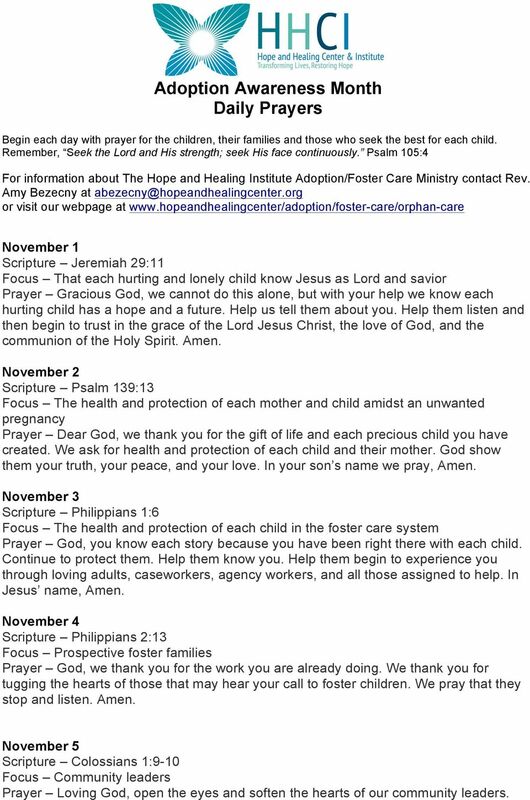 Psalm 105:4 For information about The Hope and Healing Institute Adoption/Foster Care Ministry contact Rev. Amy Bezecny at or visit our webpage at November 1 Scripture Jeremiah 29:11 Focus That each hurting and lonely child know Jesus as Lord and savior Prayer Gracious God, we cannot do this alone, but with your help we know each hurting child has a hope and a future. Help us tell them about you. Help them listen and then begin to trust in the grace of the Lord Jesus Christ, the love of God, and the communion of the Holy Spirit. Amen. November 2 Scripture Psalm 139:13 Focus The health and protection of each mother and child amidst an unwanted pregnancy Prayer Dear God, we thank you for the gift of life and each precious child you have created. We ask for health and protection of each child and their mother. God show them your truth, your peace, and your love. In your son s name we pray, Amen. 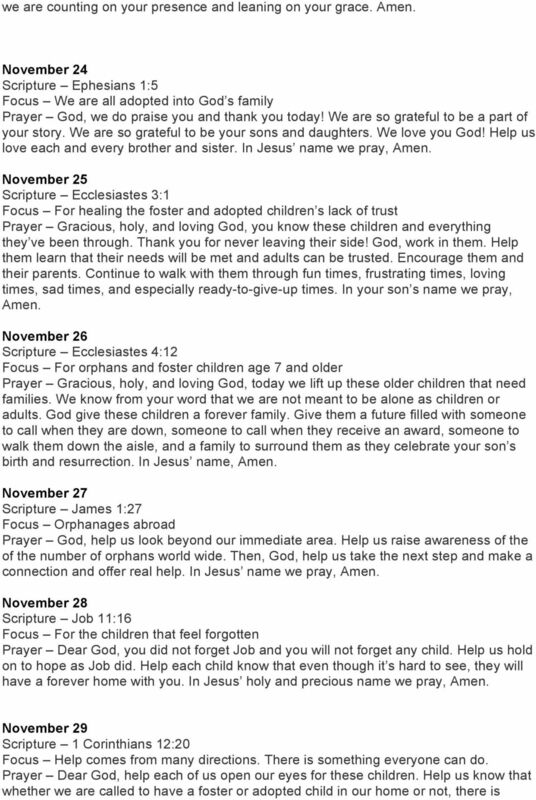 November 3 Scripture Philippians 1:6 Focus The health and protection of each child in the foster care system Prayer God, you know each story because you have been right there with each child. Continue to protect them. Help them know you. Help them begin to experience you through loving adults, caseworkers, agency workers, and all those assigned to help. In Jesus name, Amen. 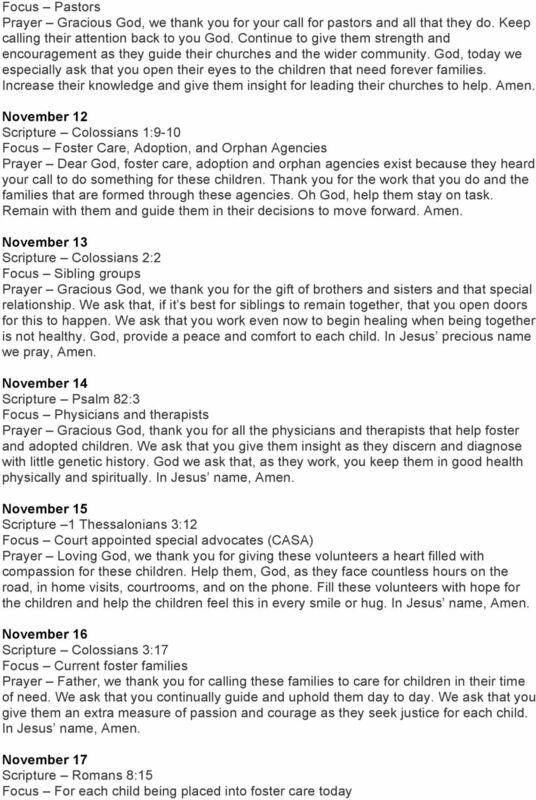 November 4 Scripture Philippians 2:13 Focus Prospective foster families Prayer God, we thank you for the work you are already doing. We thank you for tugging the hearts of those that may hear your call to foster children. We pray that they stop and listen. Amen. 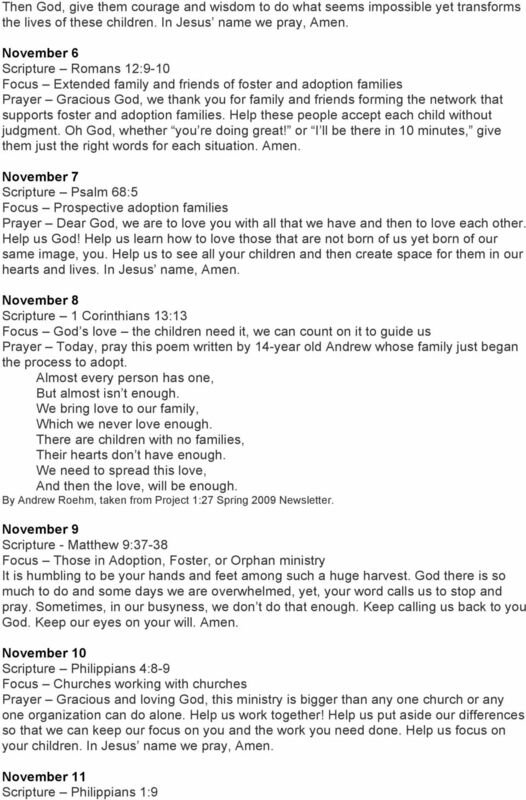 November 5 Scripture Colossians 1:9-10 Focus Community leaders Prayer Loving God, open the eyes and soften the hearts of our community leaders. These prayers and intercessions are intended to bring sisters to light throughout the liturgical year. I thank my God every time I remember you. In all my prayers for all of you, I always pray with joy because of your partnership in the gospel. to happen Light one candle This first week of Advent, we begin to prepare our hearts and souls for Jesus by working on different things each day. BOOKS OF THE NEW TESTAMENT Matthew, Mark, Luke, and John, Acts, Romans, two Corinthians, Galatians, Ephesians, Philippians, Colossians, two Thessalonians. 27 books, 27 books, Take a look at the New Testament. Pause: What s on your mind? Are you worried? Are there things you want to change? Would you like to thank God for something? Bubble Tube Prayers What s on your mind? Are you worried? Are there things you want to change? Would you like to thank God for something? The bubbles show that our thoughts go up to God. God sees everything. s Lord, let us not dwell in the past, nor worry about the future. We cannot undo what is done. We cannot foresee what will come. Let us instead dwell in your peace, love and be loved, heal and be healed. We ask each family to take a few minutes each day to pray for all those at Camp WOW and specifically for your child / children attending. Little Churches All Around (Missions) Teacher Pep Talk: So, the church grew. The Great Commission was a BIG job, and God had provided the power to do this big job by sending the Holy Spirit at Pentecost. THEME: We need to come to Jesus with hearts of wonder and worship. Romans 8:28. Isaiah 26:3. And we know that in ALL things God works for the good of those who love Him, who have been called according to His purpose. The following are the Bible Verses and Prayers you will hear during the 45 minute Christian yoga video, available at www.theyogaprayer.com Prayer 1 The prayer of a righteous person is powerful and effective. Lesson 3 Worship in Prayer In Lesson 1 we learned that worship is fellowship and communion with the Lord. This is why God made us. He wanted to share His love with people who could love Him in return. WITNESS FOR CHRIST PERSONALLY AND AS A PART OF THIS CHURCH FAMILY! + Remember: a major part of praying is listening. Take time to hear what God is saying to you. Chapter 1: The Beginning of Life as We Know It Bible Basis: Genesis 1:1 3:24 Bible Verse: So God created man in his own likeness. He created him in the likeness of God. He created them as male and female. A Woman like Dorcas WORKSHEETS. Who s our Example? Study 1. The story of Dorcas - Acts 9: Study 2. Doing good : What does it look like today? A Woman like Dorcas 5 Bible studies on Christian Service WORKSHEETS Study 1. The story of Dorcas - Acts 9:36-42 Study 2. Doing good : What does it look like today? Study 3. Doing good : What s the Standard? The Trinity is a mystery. Even great theologians don t completely understand it, and some scholars spend their whole lives studying it. Foundations Class Week 4: Holy Spirit. Who is the Holy Spirit? The Precious Holy Spirit One of the most precious and valuable gifts that God gave us, as believers, is the Holy Spirit. The Holy Spirit came to dwell in each one of us the moment we became born again. SESSION ONE TALKING WITH YOUR FATHER. As you grow as a Christian, prayer will become an important part of your everyday life. It is possible to know God personally. In fact, the very reason God created us is so that we might know Him. personally. KnowHimPersonally. It is possible to know God personally In fact, the very reason God created us is so that we might know Him personally. KnowHimPersonally.com But to many people, God seems very far away, distant, and impersonal. This reading is followed by a Psalm which can be read or sung. Can you find the book of Psalms in your Bible? Lesson 1 The Assurance of Salvation. I. Let us review how we receive eternal life through Jesus. (1) What is the result of sin? Lesson 1 The Assurance of Salvation Congratulations, you have been born into God s family, becoming a child of God. From now on you have a new relationship with God and receive all of His promises. I. THE WEDDING OF AND LOCATION: DATE: GATHERING Seating of honored guests. Procession of all members of the wedding party.